Some great articles from a great UK model shop - skip down the page until after the two large pictures and you'll find 4 links. 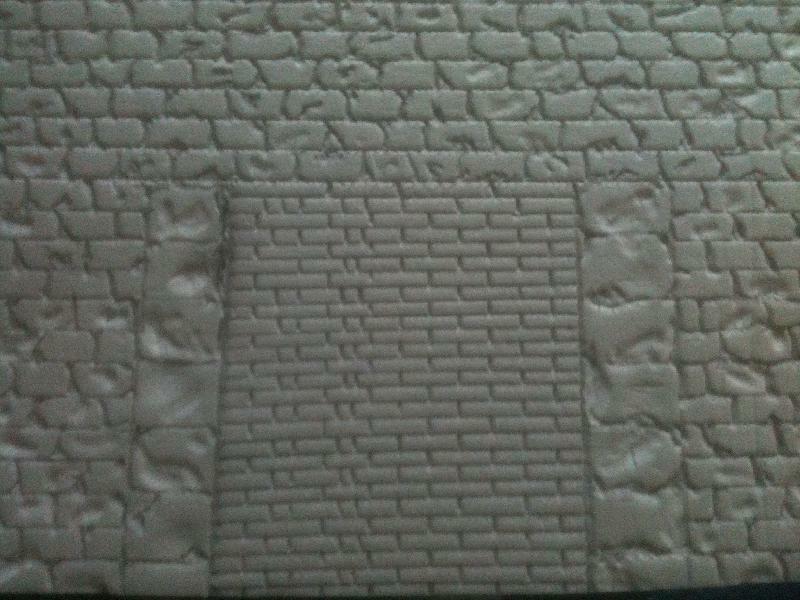 The styrofoam and foamboard ones in particular had some handy advice, particularly like the uneven bricks tip! Thanks,it worked fine for me.great info! Seems all articles are stored in facebook and you need to be a member to see them. I am among the few on the planet who still refuse to jump on the Facebook train ..
Any chance someone could make a pdf or other copy of it ? I went from the link that Moronguhl provided , went straight there. I to have resisted the farce book train! What a great find. This will take a lot of effort out of making brick walls and other items. I particularly like the distressed (spalling) brick effect. Thanks Christian, the link worked for me. Wow! I may never buy textured plasticard again if I can get results like that with foamboard! My thoughts exactly. Over huge areas it could be a little time prohibitive but it would be so light and flexible and the costs savings must be pretty big. And no problems with complex brick patterns and lintels. If you can imagine if you can draw it! Sorry about the Facebook link folks, thanks for finding alternatives. I seem to be doing something wrong. Both of those links seem to bring up " web page not found"... And from what has been said, I'm missing out big time. david colley jnr wrote: I seem to be doing something wrong. Both of those links seem to bring up " web page not found"... And from what has been said, I'm missing out big time. You like me did probably go there by using a smartphone or tablet. If you do not know how to tell your browser how to act as desktop, just use another computer. Had a go at the technique with the spare bits of foam board that I have. Must be an inferior make compared to that in the link as it is a PITA to get the paper off. You can tear strips but it always leaves a thin layer behind. However, once it's finally off scribing the foam is quite straight forward if you've the patience. I have a cliff/quarry face to make shortly and I'm going to try it for this. For standard foamcore (not kapa) I get the paper off by soaking in water for a few minutes, until the paper & glue are mushy; then just rub it off under running water. just did that with a test piece.Got the paper off now drying it in the sun. and really like the result. Well next step will be the coloring.That will be fun too allowing me to test different colors. Anyone have any tips on a base color or paint to seal it? the distortion is created by the angle it was photographed at. Did you make some sort of tool to make the indentations? no no tool made.Just the end of a coffee stir stick and a pencil. Hey, this is pretty neat! I am on Farce Book and am going to be sharing that link with a good dozen people! I'm confused (No change there then ) I thought the curved rock building with columns in the article was made of Styrofoam and not Kappa or similar. Interests: I likes anyfink wiv wheels, I duz. At the moment I am building a Narrow Gauge Layout, 1/32 scale on 16.5mm (0n16.5) track. Cross Kitter wrote: I'm confused (No change there then ) I thought the curved rock building with columns in the article was made of Styrofoam and not Kappa or similar. There were four links on the page: one about styrofoam pillars/niche, and another about separated foamboard. If all else fails; read the instructions. My Mum calls me Steve. 1:32 on 16·5mm track. Gnot strictly minimum gauge... but it is the minimum that I'm working with ! And now... a critter in 1/24th... from scratch!